Create and delete FAQ categories and answers. Monitor agents, queues, groups, and campaigns. Create and run historical reports for contact center metrics. Delete customer and case records from the Local CRM. Pull and delete pending email interactions from a queue. Use the Monitoring tab to remove agents from queue assignments. Configuration Manager administrators can grant supervisor privileges to an agent and allow permissions to monitor groups, queues, and campaigns via Agents > Supervisor. Select This user is supervisor. Open the Queues, Groups, and Campaigns tabs for more configuration. This user is supervisor If enabled, the user is granted supervisor rights. Allow this supervisor to monitor calls If enabled, the supervisor can join agents phone calls in progress for monitoring purposes. Restrict report privileges If enabled, restricts the data a supervisor views in historical reports. The supervisor views the groups and queues they monitor, or are a member of. Assign All If enabled, the agent is assigned to all available queues, groups, or campaigns defined in the tenant. Media Displays the type of media queue such as Chat, Email, Outbound Phone, Inbound Phone, or Voicemail. Name Displays the name of a queue, group, or campaign, such as Chat Channel or Support Queue. Default Priority Indicates the priority number of the queue as set under Queues > Properties > Default Priority. This number determines the priority of all interactions for a queue where 1 specifies lowest priority and 10 specifies highest priority. 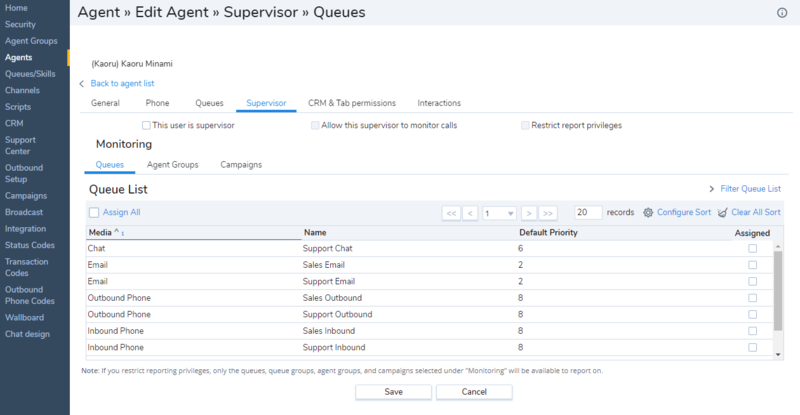 For details, refer to Define Inbound Phone Queue Properties. Agent Count Indicates the number of agents in a group. Comment Displays the description or comment of a group entered when creating a group and under Group > General. Status Shows the campaign status, such as completed, running, or stopped. Enabled Shows if the campaign is enabled. Queue Displays the queue associated to a campaign. You can specify the queue in Campaign > Properties. Caller ID Displays the campaign's caller ID specified when defining a campaign. The campaign's caller ID can be a channel number. CRM Object Displays the campaign's CRM Object, such as customer, specified when defining a campaign. Assigned If selected, assigns an agent to the selected queue, group, and campaign.